Rogue Amoeba has released Airfoil 3, a significantly updated version of their $25 software package that was originally designed to allow any application or audio source, not just iTunes, to play audio through speakers hooked to an AirPort Express Base Station. The latest version can also play audio through remote Macs that are running the Airfoil Speakers software, included with the release. In addition, it can sync remote audio with video playing on your computer using the new Airfoil Video Player that’s part of the package. Rogue Amoeba notes that Airfoil synchronization is now “perfect”: Each remote AirPort Express receiving audio gets it at precisely the same time, which wasn’t possible with previous releases. Upgrades from previous releases cost $10. 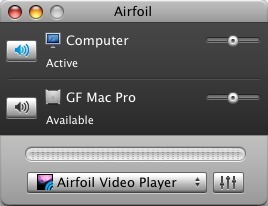 Airfoil 3 requires Mac OS X 10.4.0 or later, and is the first Airfoil release that works correctly under Mac OS X 10.5 Leopard. A fully functional trial version that overlays noise on the audio stream after 10 minutes of continuous playback is available as a 9 MB download.